The most fun you can have in, or out of, the sun. 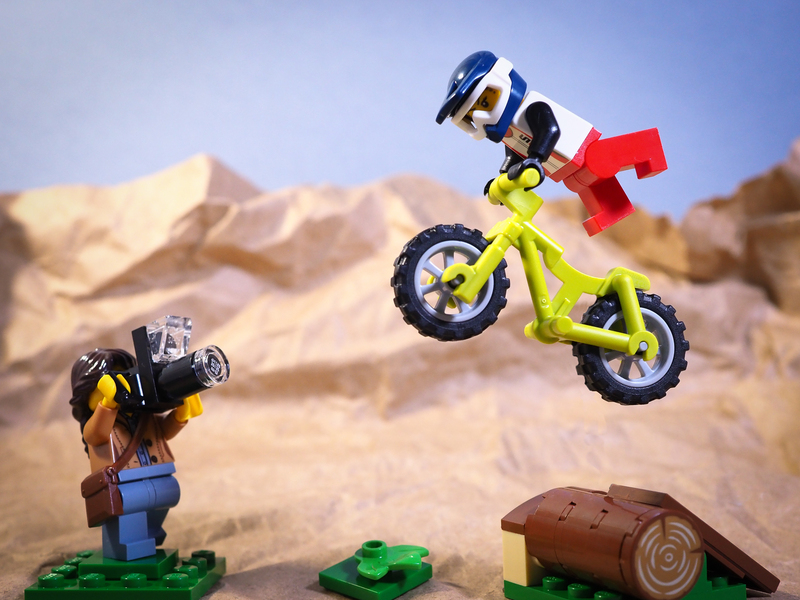 The Outdoor Adventures (60202) set is 164 pieces of photographic potential. 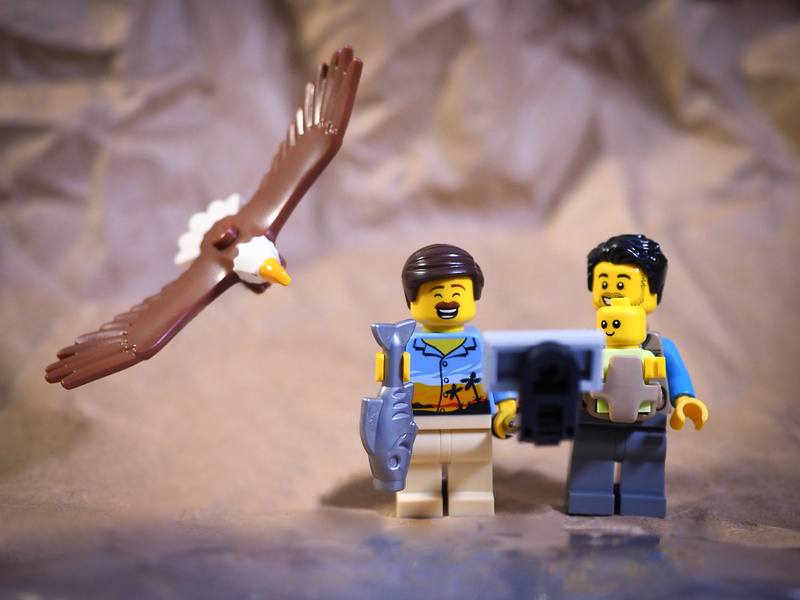 The eagle (6232185) is an absolute gem and is already being poached from the sets and being sold for 20% of the set price online. It is modelled on an American icon, the Bald Eagle, and is designed with outstretched wings with the detail of individual feathers showing. The rubber raft (6099480) is not that rare and has been around in various colours since 1997; however, if you don’t own one yet, this opens up many opportunities for your muses to get into the water. 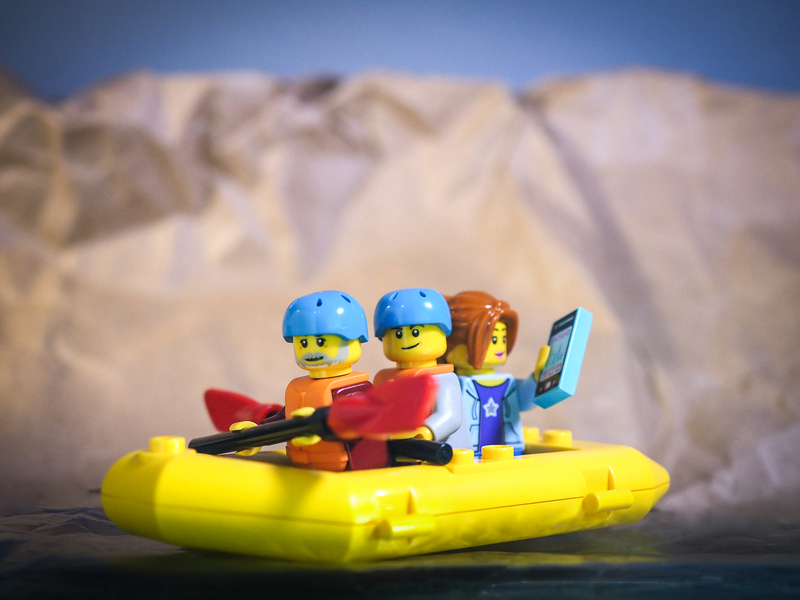 It is well balanced and floats easily with three Minifigures on board. The addition of two oars, two helmets (three if you include the one on the mountain climber) and two life jackets (in a new style/colour), opens up the flexibility of the inclusion. The tent is sweet and even includes two mattresses and pillows made from various tiles and plates. The tent canvas (6228814) can be set in three positions with front and rear flaps neatly tucked into the sides, or left open where they naturally ‘pop’ open 90 degrees from the closed position. Nice printing with clear latticed sections allows for photography inside the tent; through the flaps, or the insect screens. The baby carrier is a nice addition with a baby, for the first time in a yellowish-green onesie (6232083). This makes a nice companion to the white and azure versions of this body. The new mountain bike frame (6228496) is offered in lime and, complete with the tyres that are normally found on motorcycles, makes a solid base for a rider. The dirt bike helmet (6207255) is also new to 2018, but can be found in nine sets, in either dark blue, or azure in the Arctic sets. 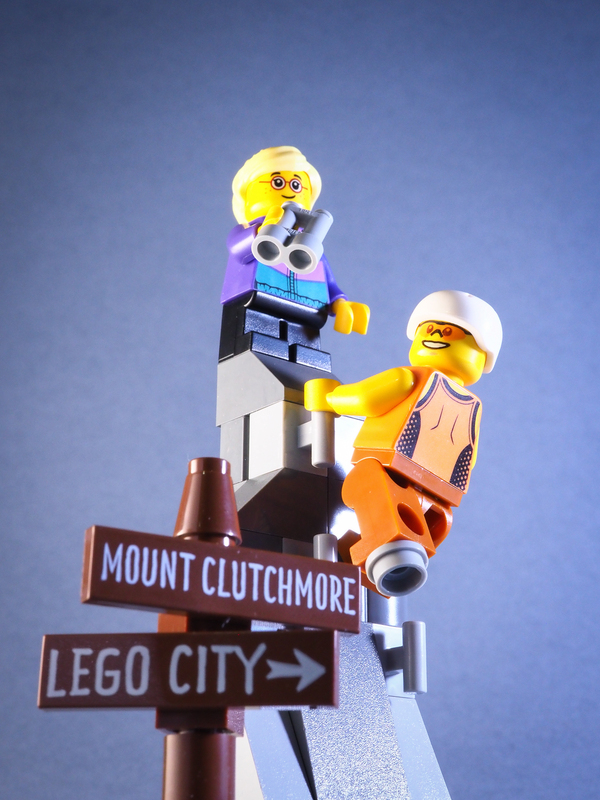 There are other new parts, such as the Mount Clutchmore and Lego City signs, but I feel they have limited photographic potential. It’s pretty neat to have nine new torsos to choose from and this alone makes the set worth the purchase. The most photogenic is the green jacket over a rampant racoon shirt. Possibly one of the most flexible is the bright pink torso with the white undershirt. It will allow for an adult female character to be dressed in casual attire that could be found in a gym, on a hike/picnic/outing, shopping trip, or even a lazy day at home. Eight new heads are also a bonus, and five are double sided (three female). There are ten hair pieces for the Minifigures without helmets and I am pretty sure I recognise most of them, at least in their shape. The light bluish gray tousled hair piece (6134617) is one exception and is very stylish. It is definitely a female cut, but could be used for characters in a wide age range. The male parent camper with baby carrier is an excellent addition to anyone wanting more family characters to shoot. 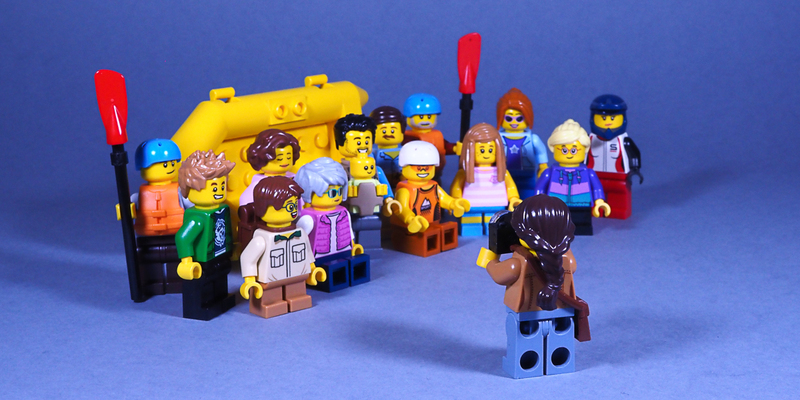 However, the the pick of the fourteen child/adult Minifigures has to be the female nature photographer. With her double sided face (one with a characteristic photographer’s squint) new brown jacketed torso, and a camera bag (6121728) that will never fit that camera with its huge zoom lens; the nature photographer is sure to please the photographer in us all. Nancy, as my Minifig has been named, has already been transferred to my favourites box that travels with me on toy photo shoots. 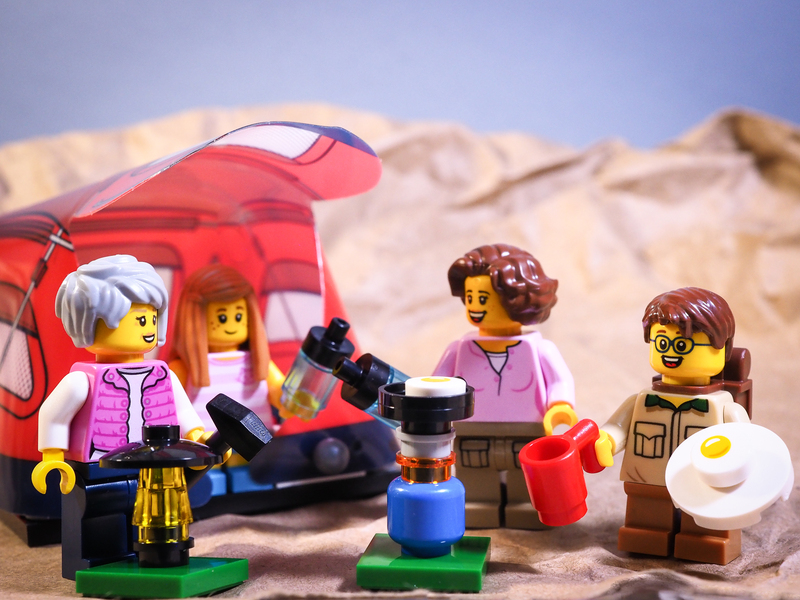 The Outdoor Adventure set is my favourite of the three outdoor City Minifigure sets offered in the last couple of years. 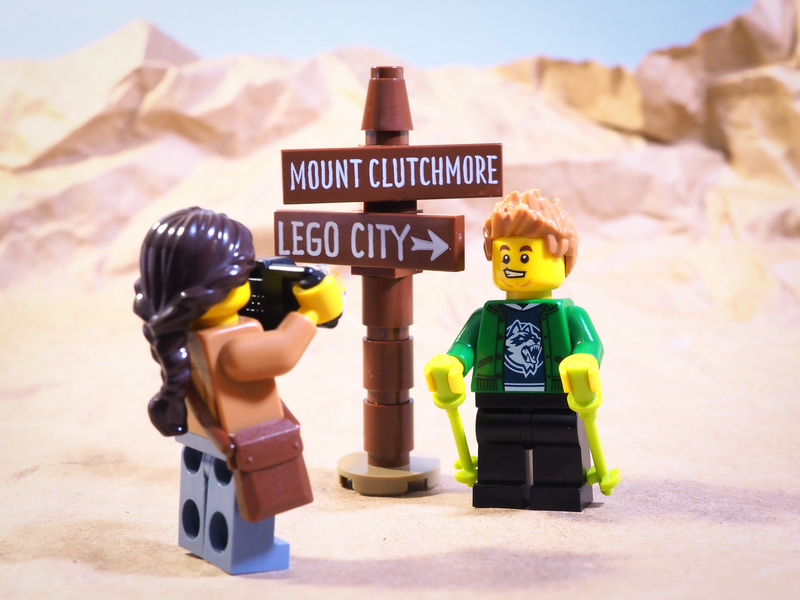 It represents excellent value for the toy photographer that wants to expand their recreational scenes and many of the Minifigures can just be added to regular crowd scenes. The inclusion of new pieces such as the eagle, baby carrier, tent canvas, and mountain bike frame, will extend shooting opportunities even further. I’m sure you will do it justice Joecow. You’ll find plenty of photographic interest in the eagle I am sure. What a great review and I got my hands on this set the first time I’ve heard about it from you. It has certainly more than doubled my minifigures collection! Nice accessories as well. The tent has to be my favourite piece. Thanks Janan. The review has had to be slotted in amongst regular posts and I haven’t wanted to shoot too many images of it until it was posted. Thanks Miss Feklista. I was inspired by the craft skills that support your toy photography. The ground/hills and water were all made from packing that came with the set. It is well worth it Julia. Nice work Tony. There is so much value in this set! Thanks Brett. I think it’s the best value Minifigure set so far. Cheers Lynn. I’m really pleased to have extra female heads as well. Awesome review! I’ve had my eye on all these City People packs, but they’re a tad on the expensive side. Thank you Zee. I understand: even though they are good value, they still have to be justified in the toy budget. Thanks for reminding me about this set. I got it back when we moved and pretty much forgot about it. Time to rearrange my stuff! I can’t wait to see what you do with them Mary.